Enjoy using Bloom by We-Vibe™ to tone and strengthen your PC muscles. 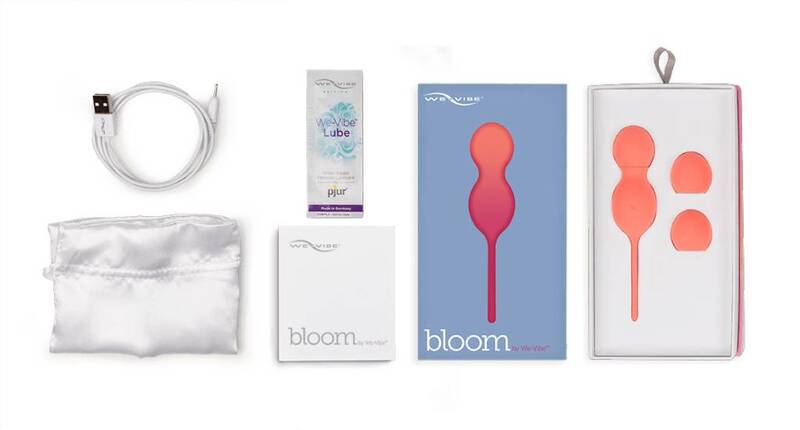 Bloom makes doing Kegel exercises a lot more fun. Easy to insert, simple to use, and with rumbly vibrations it adds pleasure to your workout. With three interchangeable weights, Bloom can be adjusted to increase your level of inner fitness. Many find that toning and strengthening your PC muscles helps with more easily reaching climax, while climaxing with greater intensity. As your muscles get stronger, increase the intensity of your workout by using heavier weighted balls (included). Of course like all stellar We-Vibe products, Bloom comes with the free We-Connect™ app so you can add pleasure by switching between preset vibes and customizing your own vibes, all from the ease of your phone. Powerful rumbly vibrations: Your workout will never be boring with over 10 different vibrations. Waterproof: Bloom is 100% waterproof making it easy to enjoy anywhere and simple to clean. Low power alert: Know when your Bloom needs a charge, so it’s ready to go when you are. Rechargeable: Convenient and eco-friendly, Bloom is rechargeable and lasts for up to 90 minutes on a single charge. No need for costly and wasteful disposable batteries. We-Connect: With the free We-Connect app you can add pleasure by switching between preset vibes and customizing your own vibes. Please Note: We-Vibe Products are not eligible for any dollar or percentage off discounts. Simply Amazing! Very Addicting to use everywhere!! Vibration settings are beyond this world! !